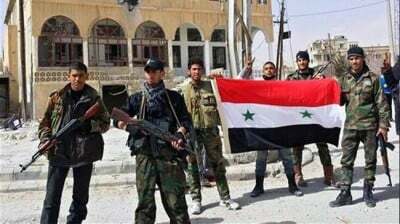 The core of the clashes for the airport has moved to the town of Sheikh Ahmad as the SAA supported by the Russian Air Force pushed the terrorist group’s defenses at its southern district. ISIS had concentrated a major part of its forces there to safeguard the buffer-zone and help drive back the SAA servicemen that were attempting to bypass the ISIS defence line. If the SAA captures Sheikh Ahmad, it will be less than 2km away from the Kuweires Military Airport’s frontlines located north of the Aleppo-Raqqa Highway. Meanwhile, ISIS attempted to advance their positions inside the Hama Governorate after a successful series of attacks that put them in position to cut off the SAA’s main supply route to provincial capital of the Aleppo Governorate. ISIS militants attacked several checkpoints belonging to the Syrian forces along the road to the town of Sheikh Hilal in an attempt to broaden their control over the Salamiyah-Raqqa road that runs through the town of Ithriyah. ISIS is aiming to block the supply road the SAA uses to reach the Khanasser-Aleppo highway. ISIS actively used suicide attacks using BMP armored vehicles in this advance. The SAA repealed the first wave of the terrorist attacks but the fighting has been continuing there. According to reports, 1100 Iraqi paramilitary fighters have arrived to the Aleppo province under direct orders from Major General Qassem Suleimani – the commander of the Iranian Revolutionary Guard Corps’ elite “Quds Force”. These fighters are members of the Liwaa Abu Fadl Al-‘Abbas group. It’s the Iraqi paramilitary force which primarily operates in the southern Damascus. The reports argue that the Liwaa Abu Fadl Al-‘Abbas fighters arrived to the town of Khanasser, which is located near the highway recently attacked by ISIS. Iraq’s army and al-Hashid al-Shaabi popular forces captured several strategic ISIS bases in the areas of East Haseebah, al-Sajariyyah, Theela and Al Sufiyyah, East of the city of Ramadi in the Anbar province on Monday. According to Iraqi reports, dozens ISIS militants were killed and scores of the armed vehicles were destroyed. Earlier the same reports said al-Hashid al-Shaab, discovered US-made military hardware and ammunition, including missiles, in terrorists’ command center in Salahuddin province. Iraq’s Kurdish fighters attacked a prison run by the ISIS militants in the northern province of Kirkuk, freeing as many as 70 prisoners. The facility is located about seven kilometers (four miles) north of the town of Hawija, which is to the west of the provincial capital, Kirkuk. Separately, some 1,000 fighters from the Kurdish People’s Protection Units (YPG) have arrived in the town, located in Nineveh Province. This comes as the Iraqi army and the country’s Kurdish Peshmerga forces are reportedly preparing to launch a massive attack on ISIS positions in Sinjar.